Parking navigation systems of exnos provide high-quality services that ensure customer satisfaction. A constant problem with the disabled parking spaces *1） provided for the convenience of wheelchair users near store entrances and exits is that their use is abused by able-bodied drivers. Install an Exnos parking space protection system for wheelchair users. A gate is installed so that the space cannot be used by ordinary vehicles. Registered wheelchair users are loaned a remote control device with which the gate is lowered in order to park. *2） Unregistered drivers can also have the gate lowered remotely by contacting the control center by intercom or calling a toll-free number. *1) Parking spaces cannot be used by wheelchair users unless sufficient room is provided for opening and closing of doors. *2) Unique IDs are used for the remote control signals to prevent abuse. 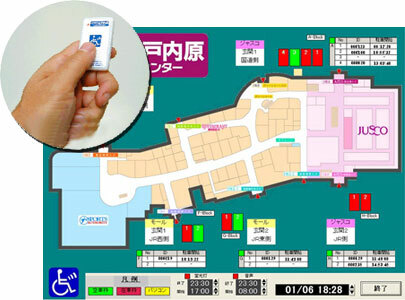 *3) Details of the parking system are different in each store. automatically return to the down position. Copyright © exnos Co.,Ltd. All rights reserved.